Finally the big day has arrived. After a couple of weeks of acclimatization, setting up the camps, going up and down the mountain in all kinds of weather conditions, here we go. Monday, August 20th, 1am. Time to wake up. Unzipping the sleeping bag. Putting on warm clothes. Tea. Chocolate. Getting out of the tent and being instantly hit by the blowing wind, our “friend” for the rest of the day… After a very slow start we are finally ready to start the summit push. 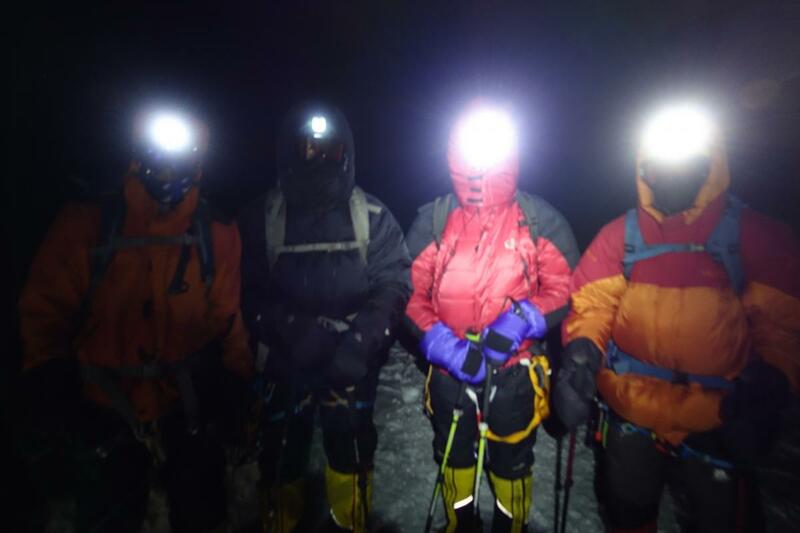 It is 2.30am as we head towards the 6400m high hill in front of us, covered with snow and rocks. Apart from the wind, the conditions are good but we obviously need to keep on moving because it is cold. Instinctively Andrew sets up a rather fast pace up the hill. No time for a second breakfast under the starry sky. At this point Markus decides to turn back due to the stomach aches that have been bothering him for the past week. He had hoped to have enough energy for the summit push. Yet, the peak that is considered to be one of the easiest mountains over 7000m proves that you need to be 100% fit on the final day. There is nothing easy in climbing over 1000m at the altitude of 6000m. We continue the climb along the western ridge, now in the beautiful twilight. As the sun rises, we admire the breath-taking view on the valley, the menacing icefall and the camps. In fact, we can see almost the entire route from BC that we know so well now. Magnificent. In spite of Pik’s Lenin popularity, everything seems empty and calm. Some steeper passages come now to spice up our journey. A short fixed rope to facilitate the passage and help us gain some more elevation. Joel feels exhausted and does not look good. The pace must have been a little bit too fast for him. We are still far from the summit as Andrew decides to bring Joel down to Camp 3. The group, reduced in size, continues in the daylight. At 6900m we are in the final part of the climb: the very large, flat and snowy plateau that is never ending… The summit or something roundish is “right there”… Michael D, Jurgen, Magdalena W and Sasha slowly continue through the field. The higher, the more slowly but our perseverance pays. 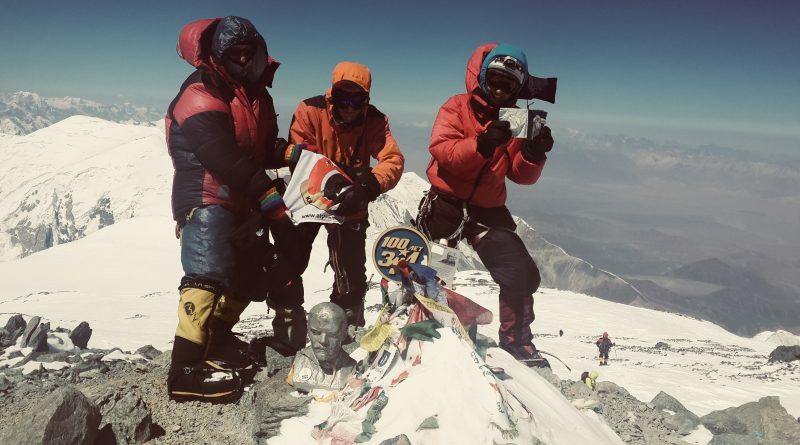 At noon we reach the summit of Pik Lenin. 7134m. One of the Soviet era summit artifacts, a head of Lenin is there to great us. Wind still blowing, we do not waste our time. Quick summit shots and we start our descend. We reach Camp 3 in the afternoon, tired but very happy. Unfortunately Jürgen has frostbite so we do not fully celebrate our success yet. Again, Pik Lenin is not an easy hike. This non-technical but demanding “hill” finds its way to wear you out. Concentrated we prepare our further descend the next day. As they say, it isn’t over until it’s over. On Tuesday morning we pack everything and join the rest of the group in Camp 2. From there we continue the very long way through the icefall and the glacier back to the ABC. Medical assistance to Jürgen. Some rest. Food. And more packing. Last trek along the glacier and we land in the BC for the diner, shower and a little celebration. Congratulation to everyone in the group! All the members gave their best and learnt a lot. As for those who did not summit this time: Michael R, Markus, Joel, Magdalena J and Jarek: Pik Lenin or other nice “hills” will welcome you next time 🙂 Thank you all for the lovely adventure!